in Creative & Tech with tags ces, CES 2017, hype cycle, innovation technology Both comments and trackbacks are closed. CES could be called the Peak of Inflated Expectations Conference because it focuses on technology and products that allure and excite, but don’t always last. At its best, CES gives us a glimpse into the future of consumer electronics and provides new ways of thinking about how technology can transform our lives. At its worst, it’s a collection of doomed dreams and half-baked ideas. But after the booths are shut down and the wrap-up articles are written, often what sounded amazing in theory, doesn’t actually work in practice — or is just not very useful. In other words, CES boils down to cool stuff and stupid stuff. The problem is, it’s hard to tell which is which until years later. What gives? In 2010, for instance, the “talk of CES” was 3D HDTV, and coming out of CES PCWorld declared 2010 the Year of the Tablet, singling out the HP Multitouch Tablet and the Sony Dash, among others. Apple chose not to announce the iPad at CES that year, and they were said to be “trumped by [the] Amazing Lenovo Tablet.” Yet as we all know, 3D HDTV is basically dead and while tablets did pan out, it’s safe to assume you’re not reading this article on your HP Multitouch Tablet or your Sony Dash. The period following CES, known to Hype Cycle specialists as the Trough of Disillusionment, is often itself an overreaction leading people to prematurely abandon something that might ultimately end up being very successful. This response leaves you on the wrong side of the Hype Cycle: buying high and selling low. So how do we learn from the past to stay on the right side? The fate of the products we’ve discussed so far hold some clues as to how to spot the next game changer among the also-rans. The key is asking the right questions. Apple is famous for creating products people don’t know they need, but seem obvious in retrospect. While the product may be new, the need is not. The Newton, for instance, didn’t solve any problems existing tech couldn’t do better. The iPod, on the other hand, did: it let us take all our music everywhere without having to worry about carrying around a CD case. It was useful, and it was better. How big is the “but”? Looking back on articles about 3D TV, you’ll be struck by how they focus on how great it is…despite the shocking lack of content and the silly looking glasses. In other words, the “but” was a foundational problem, not just something to tweak. If you find yourself making excuses for your “but,” beware. Sometimes good ideas happen at the wrong time, which is why seemingly dead technology will rise from the grave, years after it’s buried. Virtual reality is a perfect example of “zombie” tech: it started as a quirky mall gimmick from the early 1980’s and destroyed in an episode of Mad About You. But since its awkward early days, it has resurfaced as an exciting new media that has garnered the attention of all the tech, gaming and entertainment players. Always keep an eye on the truly good idea that people have abandoned for no good reason. Name brand or lame brand? Every good tech entrepreneur knows that brand association goes a long way in legitimizing new concepts and ideas. When a big brand throws its weight behind a new technology, it gives consumers the confidence to try it. So when Oreo builds a 360 video version of a cookie dunking experience, it matters, because we trust Oreo as an authority on cookies, and therefore can trust 360 video as a new medium. A big brand can overcome big barriers. Will it pass the ’13-year-old girl’ test? When it comes to social media technology and personal consumer electronics, one sure-fire longevity test is to hand it over to a 13-year-old girl and wait. If she can’t stop playing with it and desperately wants her friends to try it, chances are you have a real winner on your hands. Bottom line: never underestimate the market power of teenaged girls. 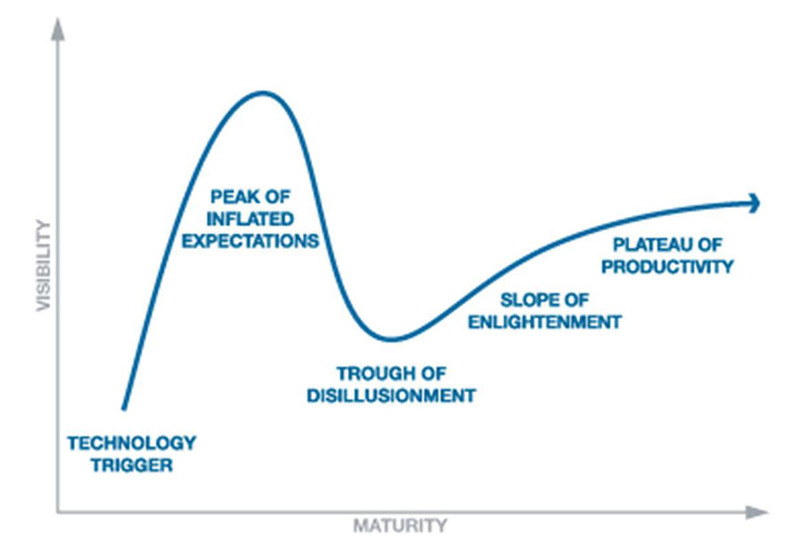 Perhaps the Hype Cycle is really a reminder for us all to have some patience when it comes to new technology. While we may not all want to rush out and invest in smart dog collars or floating speakers, we should not dismiss them so easily. In ten years, we might all be wearing smart dog collars and loving it. Jason Hartley, 360i’s VP and US Search Practice Lead and Layne Harris, VP of Innovation Technology at 360i contributed to this post.